We are the premier advertising agency in Bangalore that provides bespoke services, both in the realm of offline and online advertising. With over 5 years of experience, we are among the top advertising firms in Bangalore that businesses prefer to choose for their branding needs. Our team of highly trained marketers, web designers, developers, seo specialists, marketing campaign managers, and sales executives ensure that your brand promotion campaigns run successfully, providing you required brand exposure. 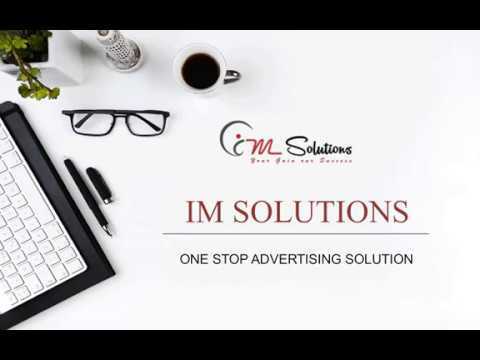 Since 2013, when the company came into existence, IM Solutions has gradually carved its way and is now one of the top advertising agencies in Bangalore, working with prominent brands from all around the world. Over the years, we have grown to become a well-known and reputed advertising agency in Bangalore that serves large conglomerates as well as SMEs. Irrespective of whether you are looking for web solutions or focus on offline activities such as Residential Welfare Association (RWA) activation, bus branding, or airport paper insertions, our experts have required competency to meet your requirements. Our holistic approach to advertising helps businesses reach a broad spectrum of consumers, both in offline and online world. Right from planning advertising campaigns to their seamless execution, it is our responsibility. Our online and offline advertising strategies help brands reach the right customers at the right time with the right branding or promotional message. All you will have to do is share your advertising goals with us and we will carve out an advertising strategy that will provide you the best exposure and help you achieve your sales goals. We do all the legwork so that you can just relax and reap the benefits. We are always the first choice for businesses since we provide services of highest quality. At the same time we keep our prices affordable without sacrificing quality of work we provide. In addition, we offer 24/7 customer support to make sure all your queries are answered promptly. Moreover, we offer no- obligation consultation so that you can share your business objectives with us. Our strong point is that we offer customized services that perfectly match your business needs and requirements. We always meet and even surpass expectations of our customers whether they are looking for online or offline advertising solutions. Branding is important for every business. We provide branding and online reputation management (ORM) services to our clients. Our experts closely monitor social media channels for negative as well as positive feedback about your business and promptly reply to the same. Right from paid marketing campaigns on Facebook, Google, and other marketing channels to search engine optimization and social media optimization campaigns, we deliver results. Contact us for any online advertising need you may have. We are one-stop solution providers for offline advertising requirement businesses have. Whether you are looking for RWA activation, paper insertions, bus branding, or other BTL advertising solutions, we have the resources to fulfill your needs. Every business needs web presence and our experienced web design development team is capable of developing your business website that amply represents your business. Get in touch with us for your logo designing, website redesigning, web development, and ecommerce website development needs. What are all the services I can choose from? We offer end-to-end advertising services which can meet all your advertising and branding needs. Our aim is to find an agency that can take care of our digital presence, are you capable of doing that? We have necessary expertise to manage and enhance your brand’s digital presence. Our team of experts with vast experience can easily handle all your digital marketing requirements. How do you maintain communication with clients? Apart from traditional means of communication such as emails and phone calls, we also use other platforms like Skype to manage all the projects. In addition, we allocate a dedicated project manager, who will be your single point of communication about your project. Do I need to commit during very first meeting? Certainly not, we do not put any pressure or ask you to commit anything before you actually want to move ahead. We are happy to get in touch with you and set up a complementary creative session to analyze your needs and develop a rough time frame, but you only will decide when you want to start the work.